Excess friction is one of the major problems faced by clients. When performing the tensioning or coil winding process using mechanical wire tensioning devices, the wire spins along the spools at high speeds. This causes friction, which can lead to the surfaces of both the wire and spools to wear off quickly. Understanding this problem, we at Armature Coil Equipment (ACE) provide clients the solutions with our permanent magnetic tension devices. Also known as magnetic tensioners, these devices contain a permanent magnet, which creates a certain amount of resistance to the rotation of the primary tensioning wheel. Thus, the magnetic device acts as a non-contact tensioning method, which reduces the wear of the wire and the components of the device. It will also not damage the wire’s coating or insulation. The unit is designed to apply constant tension to single or multiple strands of round, non-ferrous wire. 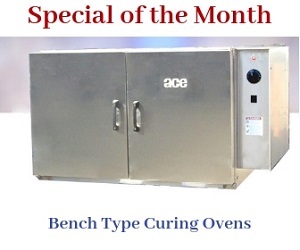 ACE provides four models within the magnetic device category – 4962, 4964, 4965, and 4966. They comprise easy-to-read calibrations, which can be used to adjust the wire tension. The basic unit consists of a steel frame, which supports the tension assembly, and a 4ʺ diameter sheave. The sheave is connected to the magnetic tension device. Other components include a spool, a spring loaded clamp, and a spindle with nylon bushings. The sheave also comprises precisely constructed ball bearings. The spindle with nylon bushings is at the bottom of the device, and helps guide the wire from the spool. The clamp is designed with a felt lining, which removes oil from the wire, while holding it in place. The wire route begins from the spool, is threaded through the bushings and spindle, through the felt lined clamp, around the sheave, and out from a bushing at the top of the device. During the operation, the user can adjust the tension as much as required. The device also comprises a mounting bracket, which allows the user to bolt the unit onto a wire stand. A socket is also provided to mount the tension unit. The ball bearings allow for precise rotation of the sheave shaft. The advantages of the permanent magnetic device comprise high levels of accuracy and repeatability. It requires little maintenance, and thus ensures a long service life. Also, the unit does not comprise any electrical or mechanical components, which adds to the device’s successful operation, long service, and minimal maintenance. The permanent magnetic tension device is capable of providing precise tension at varied levels of torque. The specifications of the same are elaborated in the table below. The device is also capable of having additional mounting brackets installed over each spool. This allows for wires of any size to be positioned and tensioned. The mounting bracket allows the device to swivel during operation. This also means that the unit can be used with machines that comprise multiple spools.